I wanted to get five years out of my previous machine, but I only made it to four and a half before I got the itch and I built this computer in November of 2017. It looked like Intel wasn't going to do anything exciting for desktop/performance CPUs on their 10nm process for at least another year or two, and I caught NewEgg on a day when they actually had some Coffee Lake inventory so I decided it was time. Intel released their 8th generation lineup with six cores at the i5 tier, a bump of two cores, probably in response to AMD's Ryzen lineup. The 95 watt 8600k boosts to 4.3GHz and, supposedly, achieves 5GHz overclocks with ease. So, that was my processor choice. I bought the power supply, CPU cooler, and case fans from be quiet! with a major goal of this build being to have a nearly silent machine. I carried over my 1070 video card and my Intel M.2 drive, as well as an old 256GB 840 Evo. My mouse and keyboard came along as well, but pretty much everything else was new. I finally retired my (nearly 20 year old) Altec Lansing ACS54 speakers and got the Logitech Z623 system which sounds amazing and packs a lot more wattage. The new motherboard also has an optical SPDIF output, so this can make a great computer for my home theater someday. I'm very happy with the S340 case, although it feels strange to have no optical drive. Build gallery here. 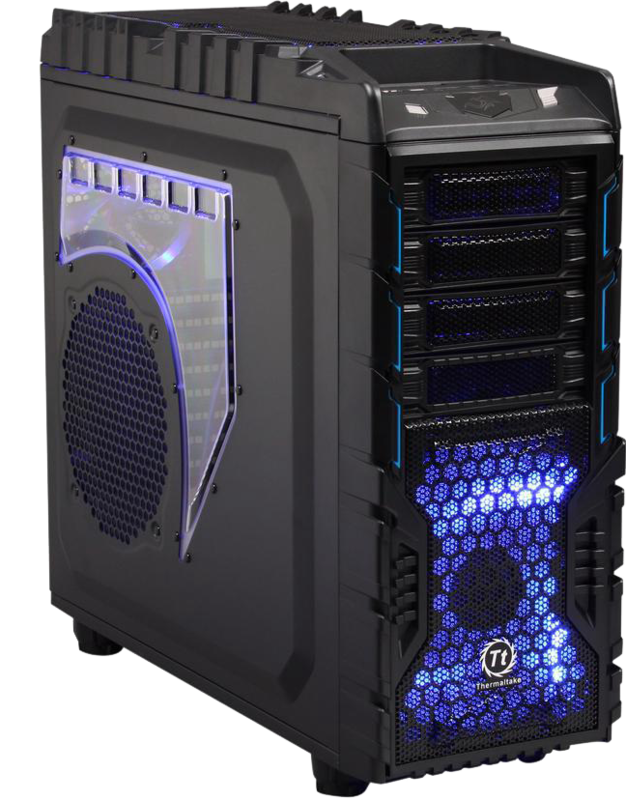 It has great cable management and a sharp-looking tempered glass side panel. 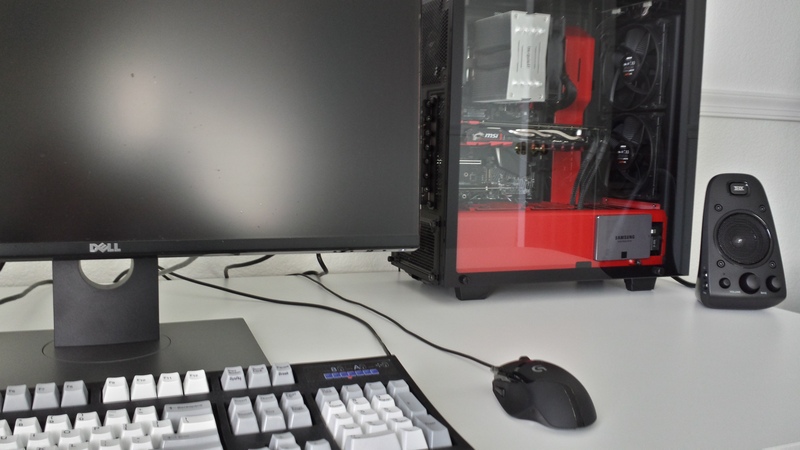 This machine served as my gaming PC until late 2017, and it was heavily upgraded since first being built in July of 2013. This was my first CPU with integrated graphics and the chip could play older titles quite well, but to play serious games you still need discrete graphics. I decided on a GTX660 at build time, offering an excellent performance-for-price, and it performed well from Battlefield 4 to Overwatch. I originally kept the Enermax Chakra case and my HP LA2405wg monitor from my previous machine. I also bought a mechanical keyboard for this system, which I have very much enjoyed having. Most upgrades for this machine trickled in over time like the ram expansion and SSDs, but the major overhaul took place in fall of 2016. It was at this time that I decided to get a 2K gaming monitor and a new NVIDIA Pascal card. The GTX1070 was the most expensive graphics card I'd ever owned, setting me back $440. It was worth every penny, though, and I wouldn't want any less horsepower paired with a 1440p display. I also overclocked the CPU at this time, as I was beginning to experience some games like GTA5 and The Division being CPU-bound. The new monitor was a 2560x1440 display that refreshed at up to 144 fps. It also has NVIDIA's GSYNC technology, which synchronizes the video cards frame output with the scan timing of the monitor making for exceptionally smooth graphics, even at lower frame rates. I had to get a full tower case to accommodate all the drives, the size of a new CPU cooler (overclock was running hot), and the new graphics card. I was not a fan of the look and feel of Windows 8 so I did not run any versions of it on this machine, skipping directly from Windows 7 to Windows 10 when it was introduced. This was my first system to make use of solid state disk drives (SSD). They provide the biggest system performance boost in years, and I became totally addicted to them. They are such an improvement over spinning media that I now have zero live content on hard disks. I used HDDs only as backup drives, with a 1TB HDD in this machine. I'll be surprised if I use HDDs for anything other than backup/archive in my future computers. In early 2017 I bought an adapter that allowed the installation of an M.2 SSD in the motherboard's second PCIE slot, freeing up the SATA bus for other drives. When I built my next computer the guts of this one went back into my Enermax Chakra case along with a GTX660 that I bought from my friend Chad, having used my original 660 in my touch-table computer. 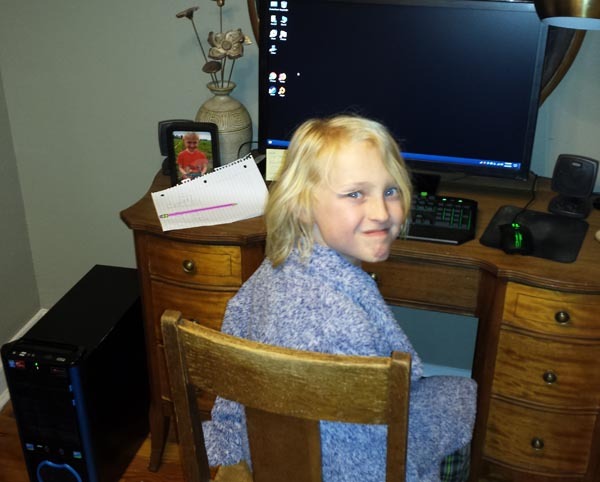 My 2013 machine ultimately ended up as my youngest nephew's computer. For my 2008 build, and newer builds, there really isn't much guesswork about my systems because I still have the invoices. I built this machine in December after going nearly five years without a new PC or a significant upgrade. In the preceding five years I owned a few consoles and did a lot of console gaming. I call 2001-2008 my "console era," when it felt like solid PC titles were few and far between. 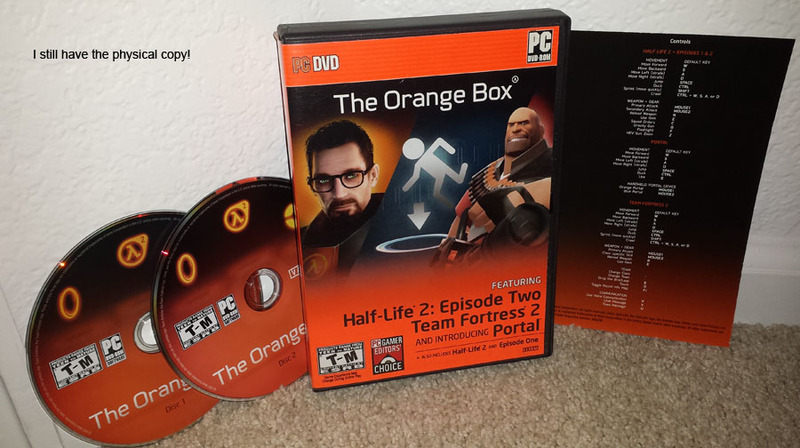 My PC from that era lasted me through Command and Conquer Generals, the Zero Hour expansion, Doom3, and Quake 4, but it was not viable going forward for newer titles like Portal and Team Fortress 2. So, I built my first multi-core-CPU system, and I can probably credit Valve's Source engine and The Orange Box for motivating me to do so. In February of 2011 the graphics card failed, which I blame on my neglecting to remove a piece of protective plastic film on the card. Eager to get better performance in LeftForDead2, I upgrade to a GTS450 (Fermi architecture.) 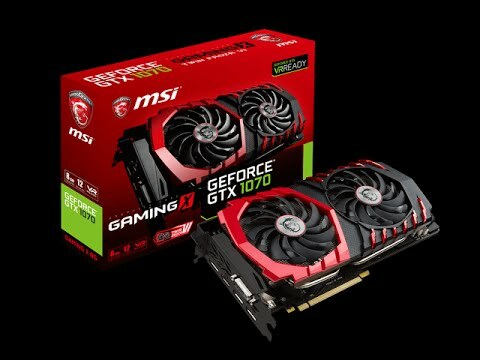 This was one of the best graphics cards I ever bought, serving me for thousands of hours in Left4Dead2 and Battlefield 3. In January of 2012 I upgraded from the Samsung 955DF tube monitor to an HP flat-panel LCD. At this time liquid crystal displays remained inferior to tubes in many ways, but they finally started making affordable 1920x1200 displays so I got one. Hoping for better performance in BF3 and other games I bought a quad core CPU (same socket, LGA775) off of eBay in Februrary of 2013. I ended up building a new system less than a year later, but technically this was my first 4-core machine. I resisted upgrading from XP to Windows 7 for a long time, but the AAA titles that were coming out needed DirectX 10 which ultimately forced the upgrade. Also, WindowsXP could only take advantage of ~3GB of RAM which was why this system only had 2GB initially. This was the first time since Windows95 that I bought a full OEM, non-upgrade, copy of the OS. I ended up being quite pleased with Win7, having skipped Vista entirely. Upgrading to a 4-core CPU helped with BF3 and other games, but the system struggled with Battlefield 4 which prompted the new build in 2013. This system served as my media machine for a couple of years. I eventually upgraded it with an SSD and gave it to my niece in a Raidmax Tornado case. I traded the 450 for a friend's 460 (a slight upgrade) and also gave her the Samsung tube monitor. This setup allows for gaming at 1280x1024x75Hz, faster than your average LCD still in 2018. I built a small form factor, 4GB machine for my mom using the Core2Duo chip and a low profile GT620 on an ASRock G31M-GSR2.0 motherboard. This is still her PC as of 2018. 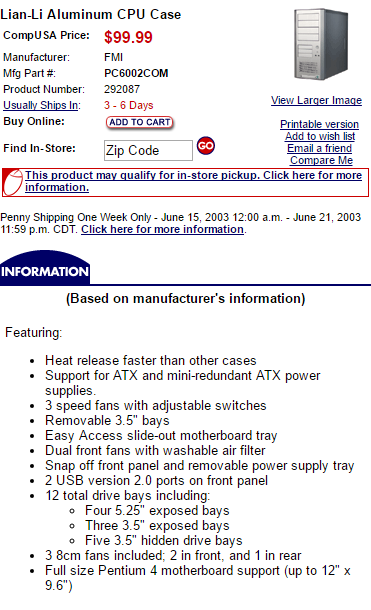 In late 2003 I ordered another system from iBuyPower. Using the Wayback Machine, I found the configurator that I used to spec it out: "Dream 2004 System Builder". However, it shipped to me D.O.A. The system wouldn't even boot and, after hours on the phone with tech support trying to get it up and running, I opted for a refund. I shipped the system back to them at my own expense and decided to build my own machine with the same specs. That was a rewarding decision, and I haven't even considered pre-built computers since. I have good notes of what was inside this machine, mostly because I didn't get rid of it for over a decade. 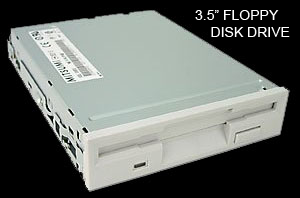 This would be my last PC to have a 3.5" floppy drive, and my first PC without a dedicated sound card. A decently fast CD burner and DVD-ROM were common at this time. I might have dropped in a DVD burner as an upgrade to this machine, but it's possible that I didn't get one until my next build. Now-defunct CompUSA is where I found a clearance deal on the Lian Li case, one of the more memorable components, which was incredibly lightweight. This computer was my first to attain longevity of over 5 years as my primary machine. This era was a low point for PC gaming, and I played a lot on consoles, so this computer was probably underutilized. However, it was a very powerful machine with a fast CPU and a fast frontside bus (800MHz). 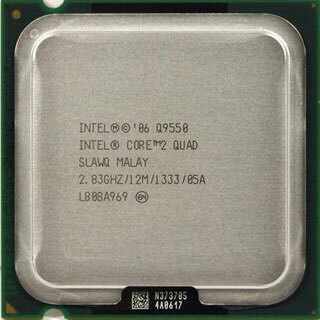 The Pentium4 processor marked the culmination of huge increases in CPU core clock rates; the physics of chipmaking going forward would favor multiple cores over a faster clock. My next machine would actually have the same core clock rate of 3GHz - but it would be a vastly superior dual-core chip. In 2008 this computer developed some crashing problems, which is partially what prompted me to start building a replacement. Later I discovered that the crashing was due to the CPU heat-sink being clogged with dust, and a thorough cleaning restored normal functionality. I had never upgraded the RAM from 1GB, so when I decided to keep it around as a second PC I bought two more 512K sticks. 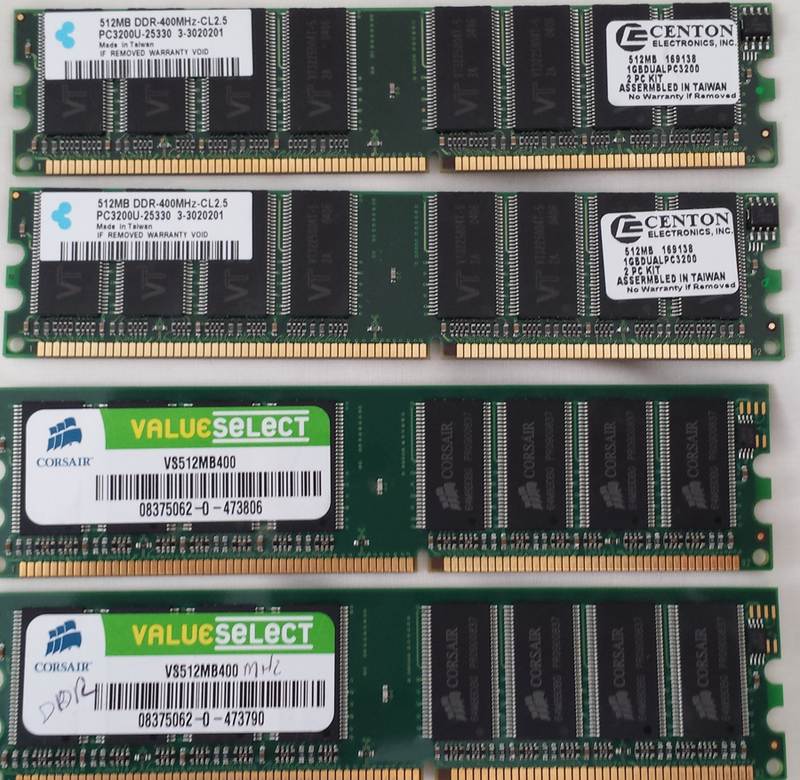 For some reason I still have these four RAM sticks today - the only component of this machine still hanging around. I kept this machine around as a media PC and experimentation box for another five years after my new build in '08. Eventually, it didn't even stream video very well and I stopped using it entirely in 2013, after a decade of service. What was left of it found its way to the dumpster in 2015. 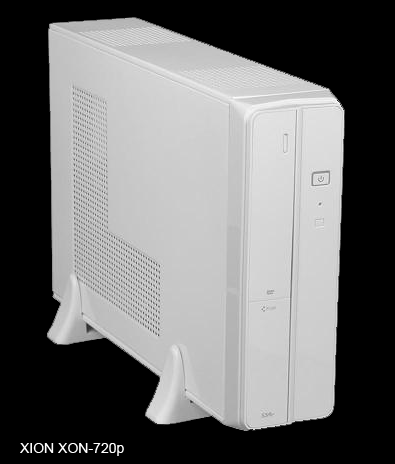 I purchased this system from iBuyPower and I believe I ordered it sometime in late fall of 2000. 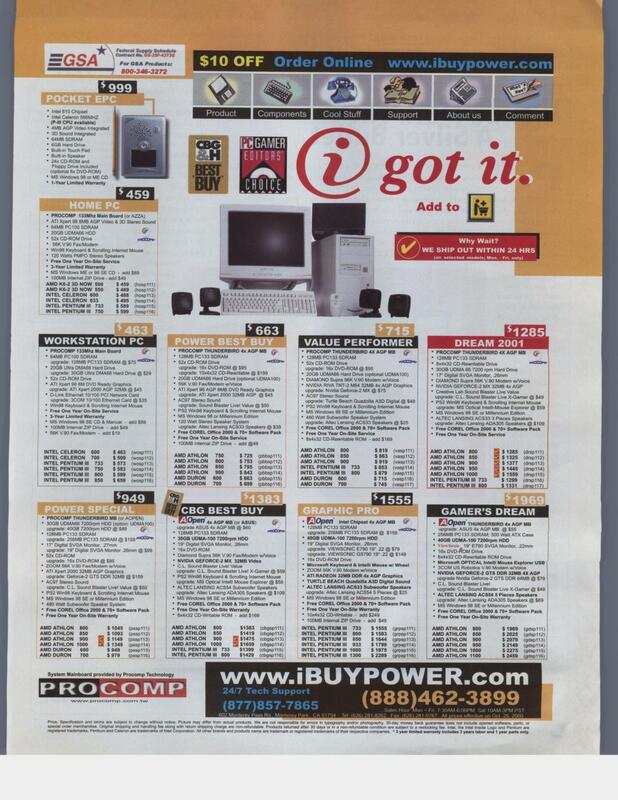 I found an iBuyPower advertisement in Computer Shopper magazine from November of 2000 (full magazine here) which backs up much of what I remember, but some of the specifics are foggy. The graphics card definitely used the 4xAGP slot and was most likely a GeForce2 or ATI Radeon, based on what you see in iBuyPower ads from that time. Suprisingly, I can't say with certainty if it was an Intel or AMD CPU but I'm positive it was a socketed 800MHz chip. I know it was not a slot-mounted CPU, so it was likely a Coppermine or Thunderbird chip. 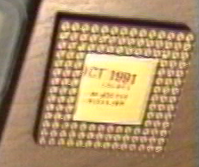 There was some privacy controversy around the Pentium 3 chips because they were the first to have a software-accessible unique serial number. I remember the controversy, but I don't recall if I was relieved to have an AMD chip or concerned because I had the Pentium. 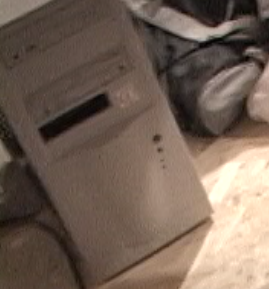 Here is a picture of the system in my basement in 2004. Here's a closeup from the Computer Shopper ad. I marked the RAM and storage on this machine as unknown, because I have no notes or recollection of what I bought. It was likely that the system had ~40GB of HDD space and 128MB of PC-133 SDRAM, with an upgrade to 256MB at some point. I remember buying my copy of Windows XP at a family reunion from a relative that worked at Microsoft. 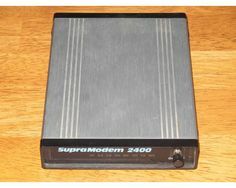 This would be my last computer to use a dialup modem for Internet access, as I got broadband in early 2001. I'm not sure which monitor I had with this computer. I have vague memories of the 17" Sampo dying on me, and replacing it with a ViewSonic of some kind, perhaps an E790. 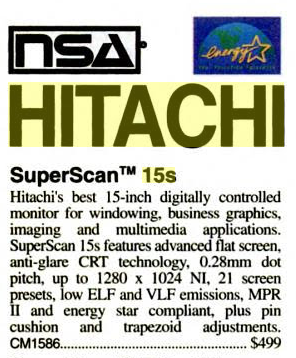 Even though there are definite unknowns with this computer, I'm confident I bought it in the fall of 2000. 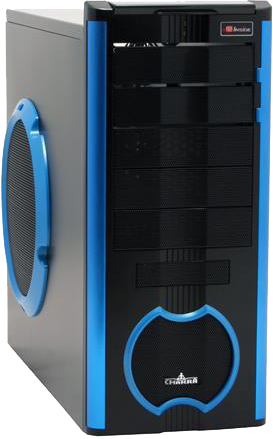 The style of case I had appears in iBuyPower ads from mid 2000 to early 2001. There was also a narrow window when iBuyPower was shipping 800MHz chips in their performance systems. 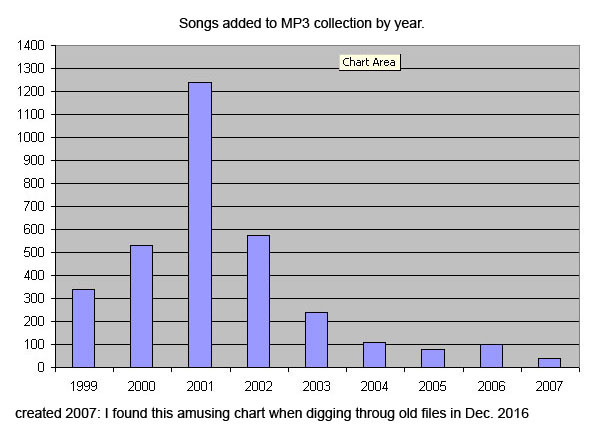 Early in 2000 they were not available, and by June of 2001 they were already low-end. 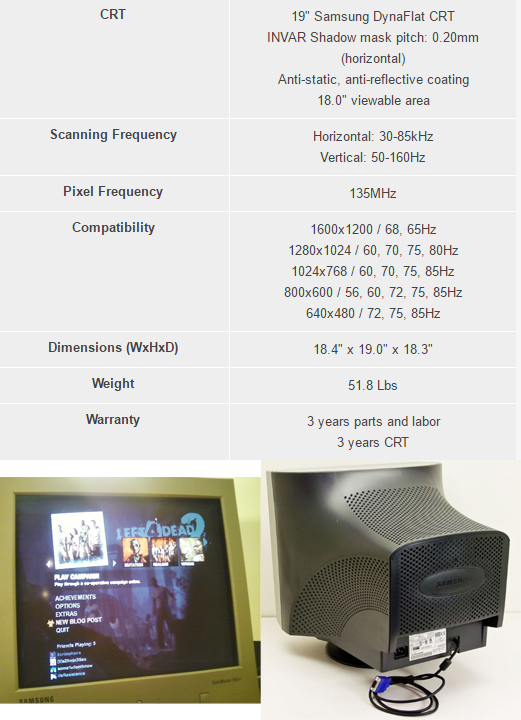 Late fall of 2000 is also when the iBuyPower ads start showing that they bundled the ACS54 speakers. This was my final system to include a speaker system, and I still had those speakers in late 2017. 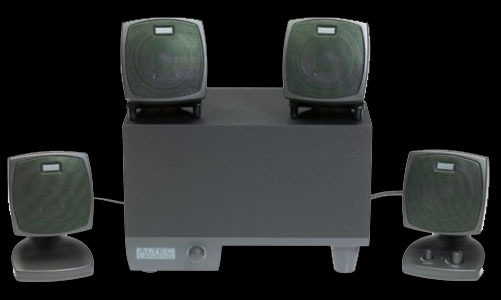 The Altec Lansing ACS54 moved with me across four computers and six houses/apartments! At some point I got rid of the surround speakers, but I still have the L+R and subwoofer. A solid little speaker system, it is my longest surviving peripheral. As far as gaming on this computer goes I probably played titles from the C&C: Red Alert 2 era, and lots more Quake 2 of course. I have a feeling that C&C Generals is what drove me to ultimately replace this machine. I bought this system in late 1997 or early 1998 as a "barebones" machine with mobo+processor, memory, case, and power supply. It probably had 64MB of RAM and ~10GB of HDD storage, but I don't have any notes to back that up. It was either a Pentium Pro 200MHz or a Pentium II 233MHz, both of which had 350nm lithography and were widely available at the time. I'm leaning toward it being the Pentium Pro, simply because I don't think I ever owned a slot-mounted processor (where the CPU resides on a daughterboard which plugs into a slot on the motherboard.) The Pentium II 233s were only available in slot-mount, where the PPro 200 was socketed. The Sampo monitor was definitely a '98 purchase, as it wasn't made in '97. My recollection of this PC is pretty foggy, and I don't have the same nostalgic memories for this computer that I do for the older ones. But I do remember getting the 3D video card, and getting severely addicted to Quake II. 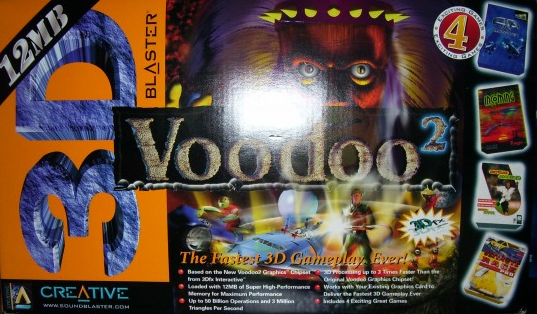 3DFX based graphics accelerators prior to Voodoo3 were for 3D only and were added to systems alongside the regular graphics card, and you used a pass-through cable to connect the two. It was also possible to SLI Voodoo2 cards together, although I never did. I remember the distinctive box for the 3D Blaster, and the bundled software - Creative didn't offer that bundle until March of '98, so that's probably when I got the card. I remember playing lots of Incoming, which was the best of the bundled games. 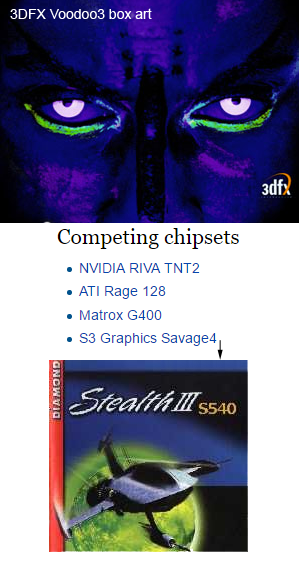 I may have upgraded to a Voodoo3 or Diamond Stealth card in 1999. I have vague memories of those cards, but they were probably just wishlist/window-shopping items. Pentium Pro, Pentium II, and Pentium III systems were popular in multiprocessor configurations, but I only ever had a single CPU. I can tell from the pictures of this system that I had two optical drives; a CD-ROM and a separate burner, most likely. 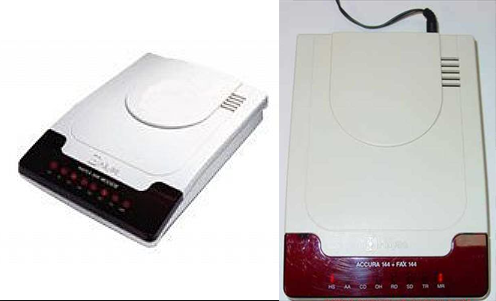 I had an external Iomega Zip drive which took 100MB removable cartridges, and connected to the system via the parallel port. I was also on my second Trustmaster joystick, the "Top Gun" edition, having worn out the first. 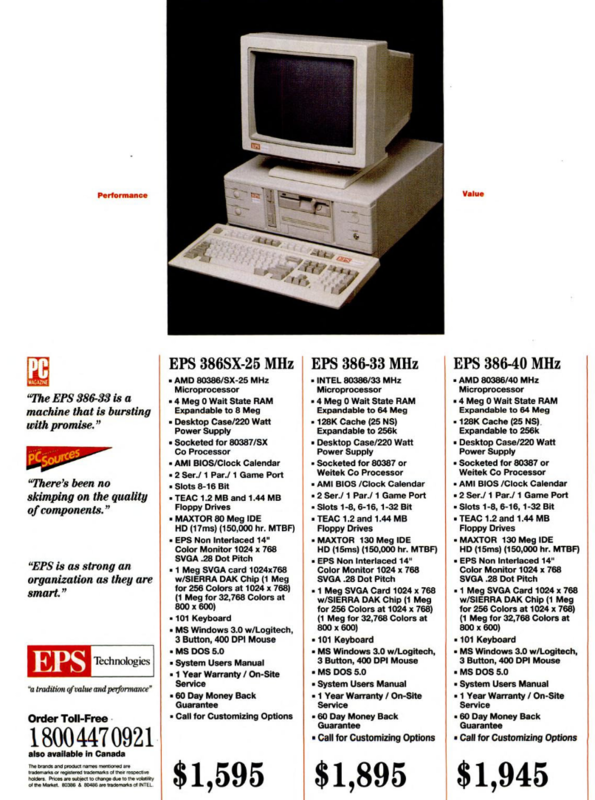 This was my second PC from EPS Technologies and the first system that I bought with my own money. I thought I made this purchase in fall of 1994, and I remember testing this CPU for the Pentium FDIV bug which validates that time frame. However, I haven't been able to find any EPS ads from late '94 or early '95 to back up my recollection. 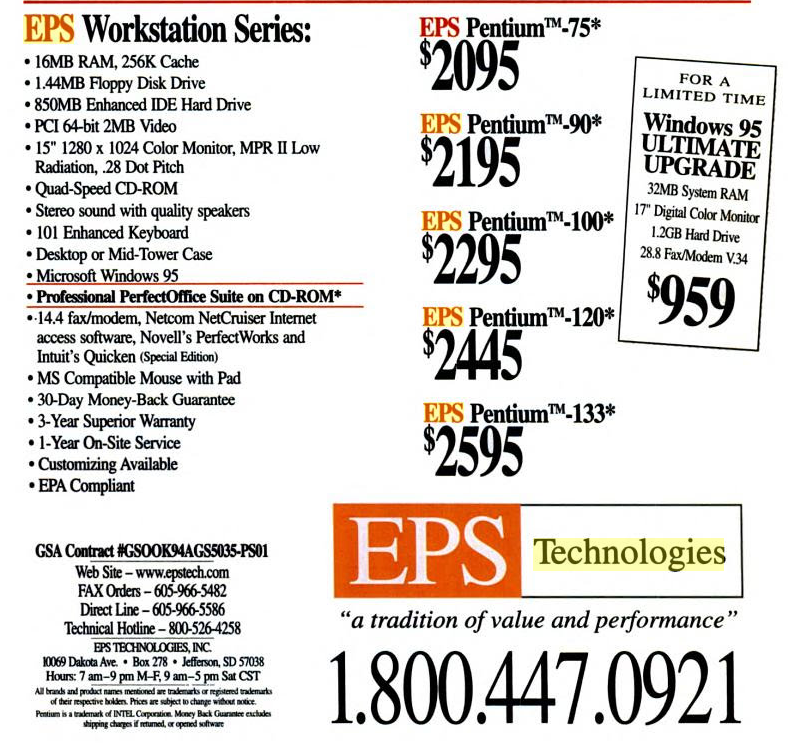 The specs from EPS Technologies advertisements in late 1995 suggest the purchase may have been a year later than I remember. If I ever find any magazines from late '94 I'll revisit this entry. 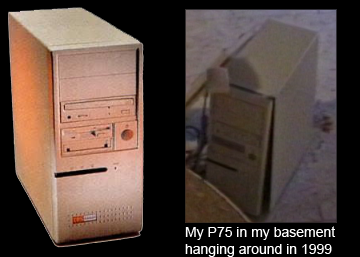 I found an old home video that I took in June of 1997, for insurance purposes, where I shot a few seconds of the computer and identified it as "my Pentium 75." That was interesting because, in the years since, I misremembered it as a P90. 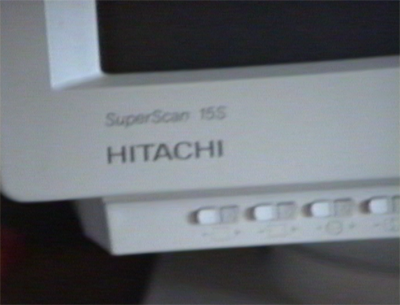 The home video also captured the monitor brand and model number, and its specs match the offering in the EPS advertisement. I remember buying a Thrustmaster joystick for playing Descent on this computer, but DOOM 2 is the game that saw the most hours on this box. I played both games over the modem against a friend, or use a null-modem cable to play against my roommate. 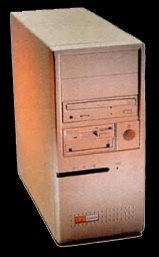 This was my first "tower" form factor machine, and it was strange and new to me. I had this machine for my last year and a half of college, and I remember buying some new peripherals when I graduated and got a job. I picked up a Microsoft Natural keyboard and a faster modem - a US Robotics 28.8Kbps. 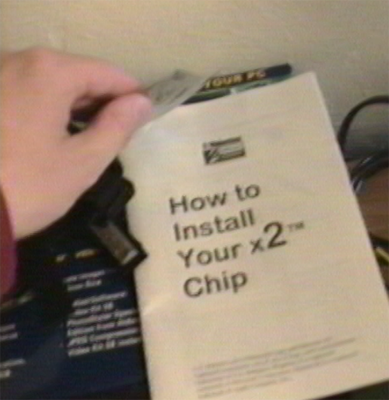 In my home video there was a shot of the modem and a manual titled "how to install your X2 chip", which was a chip you could drop into US Robotics modems to get them up to 56K. That is, if your dialup provider matched that speed and your phone line quality was good enough. 56K speed was as good as it ever got for dialup, and typically you rarely got it. At some point I dropped an 8X CD ROM into this machine, which seems an odd upgrade, but I do mention that in the home video. I don't know if this machine ever got a 3D video accelerator, but I don't think it was around much longer because Quake II was about to come out in late 1997. I'm pretty sure that's what drove the purchase of my next computer. 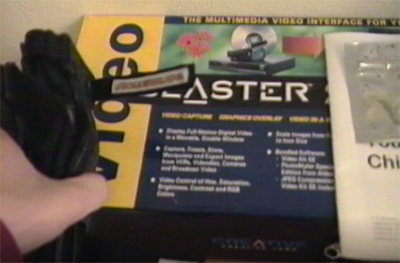 In my home video I shot a few seconds of the box of my Video Blaster by Creative Labs. This was a card that facilitated video capture, gen-lock and chroma key. I was always very interested in digital video editing which was slow to come to the PC consumer grade, even though Amiga computers had it for years. I had high hopes for the Video Blaster, but it was a source of endless headaches with IRQ conflicts, memory configuration and system crashes. The Pentium75 barely packed the horsepower to do any serious video capture, and forget editing. I would not end up doing any digital video editing for many years to come until true digital camcorders with FireWire came out. 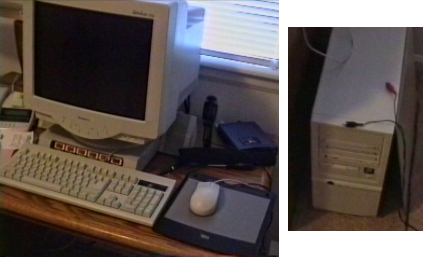 In late 1991 my parents ordered a new computer, which I took to college the following fall. They ordered from EPS Technologies who had a reputation for high performance systems at good prices. I have a picture of the back side of my actual CPU. The 386DX-40 was a massive leap forward over the 8088 that I'd been using since 1984, with ten times the clock speed, eight times the RAM, and a lightning-fast hard disk. The video capabilities were 3 generations newer; the difference between CGA and SVGA was staggering, in terms of both resolution and number of on-screen colors. 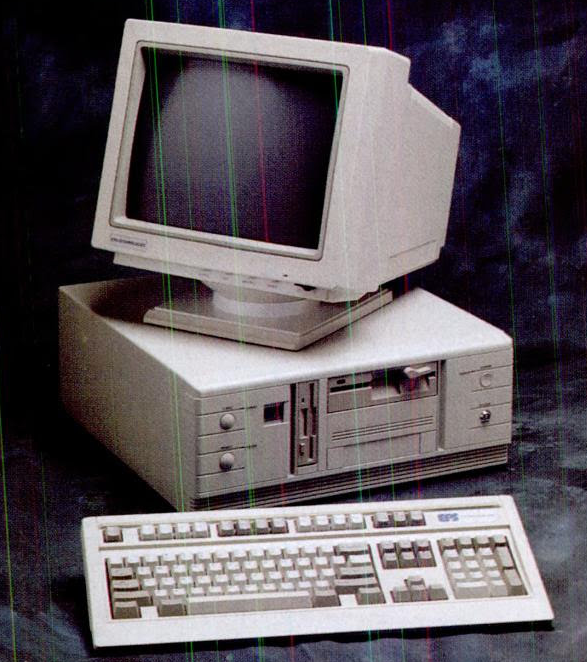 Personal computer systems back then were phenomenally expensive compared to today, with this machine costing the equivalent of $3500 in 2017. I can see why my folks hadn't replaced the family PC in seven years. 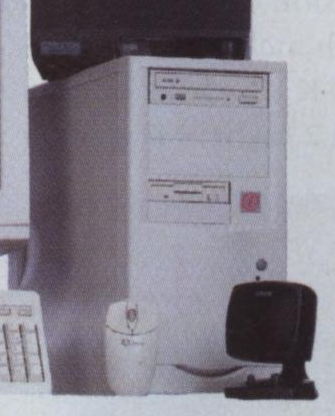 I found some ads from PC Magazine from early '92 and found a picture (below) of exactly what my machine looked like, with the EPS logo in blue trim - not the red that they would adopt soon after. This advertisement, which is probably a few months newer then when my PC was ordered, confirms most of the specs I remember. 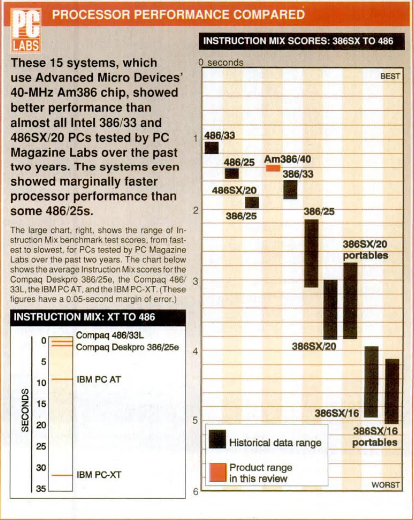 The 386DX-40 was a powerful machine, actually outperforming the 25MHz variants of the 486SX. It even held its own against faster 486 variants when equipped with a math coprocessor. Before the 486DX the CPU only operated on integers; floating point operations were not natively implemented in hardware. If your 386 motherboard was socketed for it, you could get a floating point unit (FPU) to speed up applications that had been compiled to take advantage of one. I ended up buying a CX-83D87-40 by Cyrix, mostly to run fractal rendering programs like FractInt. If you're interested in learning more about math coprocessors, here is a fascinating old document that I found titled "everything you always wanted to know about math coprocessors". Games I got for this machine early on included Lemmings, A-Train, Jetfighter II, and Sim Ant. A huge early favorite of mine was Wing Commander II. One of my cousins came to visit over his spring break, and we played it for at least eight hours a day. In college I played a ton of Wolfenstein 3D and later, Doom - although that game pushed this computer pretty hard. This machine went way beyond games for me; it was the machine that really got me into structured programming languages. Someone recommended Pascal to me as a good learning language, so I picked it up. Later I'd learn C and C++ using Borland Turbo C++ 3.0. I think it was late '92 or early '93 when I upgraded to a faster modem. This would be my first computer to connect to the Internet, using a SLIP/PPP dialup connection. I mostly just retrieved my university email, but I did use the LYNX browser occasionally. This system eventually saw my first inkjet printer, the HP DeskJet 500c. The Panasonic Sr. Partner was our family PC for a decade, and I still have it in my possession. Based on some hand-labeled floppy disks and the manufacture date on the machine itself, we got it sometime in the spring of 1984 when I would have been ten years old. Amazingly, it is still completely functional today with the exception of the backspace key on the keyboard, and most of the floppies I have for it still work. The Sr. Partner was known as a "luggable PC," the mid 80's idea of portable. The Sr. Partner weighs in right around 30 lbs. without any media or manuals, and it has a built-in carrying handle so you can lug it around like a suitcase. When configuring for transit the power cable stows neatly behind a removable plate in the rear, the keyboard folds up and latches to the front of the machine, and the printer cover locks in place. It has a built in CGA monitor capable of sixteen brilliant shades of green, but only four on-screen at the same time, and a port for an external RGB monitor. 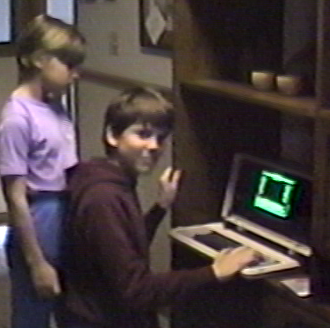 Here is a picture of my sister and I using the computer in ~1987 and a video of my Sr. Partner that I made in 2013. 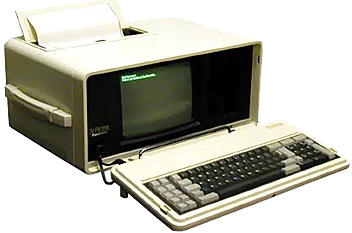 I learned BASIC, my first programming language, on this PC and the Apple IIe at my elementary school. The BASIC interpreter that was included with the Sr. Partner included a manual that I would spend hours leafing through and reading the available commands, most of which I didn't understand. My parents used the Sr. Partner mostly for word processing using Word Star. We also had a program called Print Master, similar to the famous Print Shop, which let you make banners, greeting cards and signs. Later, my parents would buy an electronic typewriter that could connect to the computer via the parallel port and "print" documents -- that is, type them out automatically. It was loud and slow, but made beautiful documents compared to other printers of the day. Some of the more memorable games that I had for this PC were the text-based adventure games Zork and Zork II, the original Microsoft Flight Simulator, and Brøderbund's Lode Runner. One of the best games I got for this PC was called Infiltrator, which simulated helicopter flight/combat and let you land behind enemy lines and sneak around the enemy base. As games and software became more demanding, we increased the 128K of RAM that came with the machine to 512K using an expansion slot specifically designed for memory. I put a joystick card in the only general purpose expansion slot, and eventually added a mouse to the serial port - mostly so that I could play the PC versions of Populous and Battle Chess. 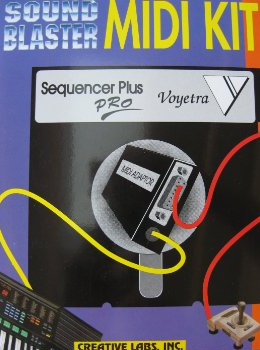 It was probably around 1990 when I got a 2400 bps modem and began connecting to bulletin boards using software called ProComm.